Our Favorite Bulbs | Faddegon's Nursery, Inc.
Fall is right around the corner, and your mind may be racing toward planning indoor activities, but don’t miss this opportunity to plant out some bulbs. You’ll be glad when Spring greets you with surprising colors, sizes, and textures! We’re here to inspire the gardener in you! 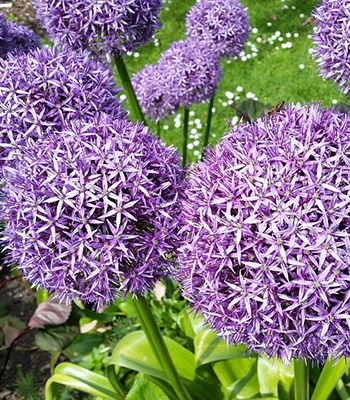 Each summer when our allium plants are in their glory, people are bowled over by them asking what that cool plant is! Alliums are certainly available as part of our late mid-summer perennial collection, but you can have those same impressive blooms already bursting forth next Spring and Summer. Look for ‘Purple Sensation’, ‘Gladiator’ and ‘Shubertii’. ‘Gladiator’ will greet you in early summer on 3′ stems with 7-8″ globes of lavender blue. Want to meet the parents? Here they are! We’re all familiar with tulips. They come in a huge variety of colors, shapes, sizes and bloom times, and they are all hybridized from little gems called species tulips. These are the true originals. There is much to be said for species tulips. Although smaller in stature and flower size, they are tough. They’ve had to be, coming from the windswept areas of Central Asia. Naturalizing an area is no problem! They will happily multiply and return year after year after year. Check out ‘Lilac Wonder’ and ‘Persian Pearl’. Cyclamen are one of the showiest flowering plants to fill our greenhouses a few times a year. Like fluttering butterflies held aloft over glossy foliage, cyclamen can capture your imagination and your heart. Many are familiar with cyclamen, but not everyone knows that there are varieties hardy enough for our zone 5 gardens! The flowers are a little smaller, but every bit as beautiful. Look for cyclamen ‘coum’ which blooms in very early spring. Crocus may be nothing new, but there is a reason they are so widely planted. The Spring show! Our long Northeastern winters can wear on our nerves, so why wouldn’t we plant these harbingers of a new season? We know the weather will be milder soon when these bright little flowers poke they’re way through the soil. And the colors are delicious! Whether you call them narcissus, daffodils or Tete-a-Tetes, they all spell happiness in Springtime. The smallest of these, Tete-a-Tetes are a dainty dose of miniature brightness at the end of winter. They are so called because the flowers bloom in pairs, like two best friends steeped in conversation. Maybe they are discussing the weather? We’ll never know, but it’s enough just to gaze at their little faces in the sun. Muscari, also known as grape hyacinths are one of the most charming flowers to pop up through the garden in Spring. Tiny ruffled bells cluster in stunning shades of blue around a central stem. Great for lovers of blue flowers, this is yet another opportunity to incorporate them into your beds. Muscari will naturalize themselves for years to come. Plant in clusters or drifts to speed up the effect. Try muscari ‘Peppermint’, which comes up in a lovely delft blue with white tops.